As mentioned in an earlier post, I have my daughter's Christening on Sunday. My second daughter, was much bigger than my first. At birth she weighted 10lb 3oz, 2lb 3oz heavier than her sister. It didn't suit to have the Christening when she was smaller, so now she's 5 months old and 2 months older than when her sister was Christened. With both these points in mind, I decided to create a new Christening gown. I also thought afterwards, how lovely it will be, to have a Christening gown to pass on to each of the girls. Anyway, I started 2 times with patterns from my head. Each time they ended up wrong! They started going out of shape before they were even finished. So I scoured the internet to find something, that I could make easily, quickly and that resembled a Christening gown. The pattern I found initially, I was not entirely happy with, but beggars can't be choosers so I started it. And by the way, despite my initial lack of love for the pattern, as it is progressing I am ABSOLUTELY loving it!! 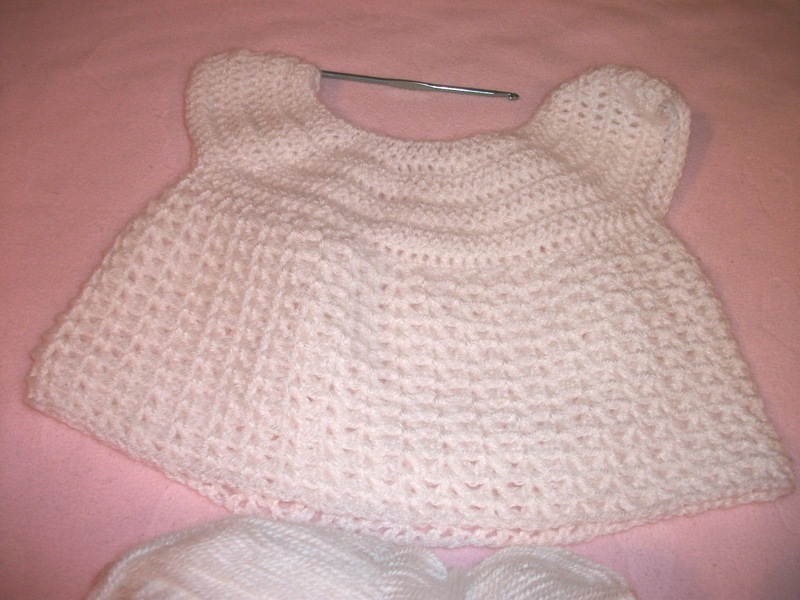 I think the picture from the pattern wasn't gelling with me, but now that I'm crocheting it, I think it's ideal!! I can't find the link for the pattern, to give credit to the creator. I will keep searching and hopefully in a later post link it.